I love the work that The Charis Project does: using entrepreneurial solutions to care for orphaned and abandoned children in Thailand. This hits on ALL my close-to-the-heart loves: kids, community, education, innovative out-of-the-box thinking. And (no surprise) the people running it are just flat-awesome-can-I-be-your-friend-types as well. Aaron and Carrien Blue are always thinking up some innovative and creative way to support their mission. This year, they’ve got some great gifts hand-crafted in Thailand by the community that supports the orphanage. I’m all about supporting people who support themselves, and this is one great (and cool) way to do it. Your gift this holiday season makes it possible for us to continue working to help the most vulnerable children in the world, kids in orphanages, and those whose families are so impoverished that they are on the verge of giving their children up in the hopes they will get a better life in a institution rather than the grinding poverty and hunger they face at home. Our work is to come alongside and lift up these orphanages and their communities, and these individual families within the communities, and empower them to bring positive change to the world around them. What better way to honor those you love than to help a child in their name? Along with each gift will come a card explaining briefly what The Charis Project is doing in northern Thailand. 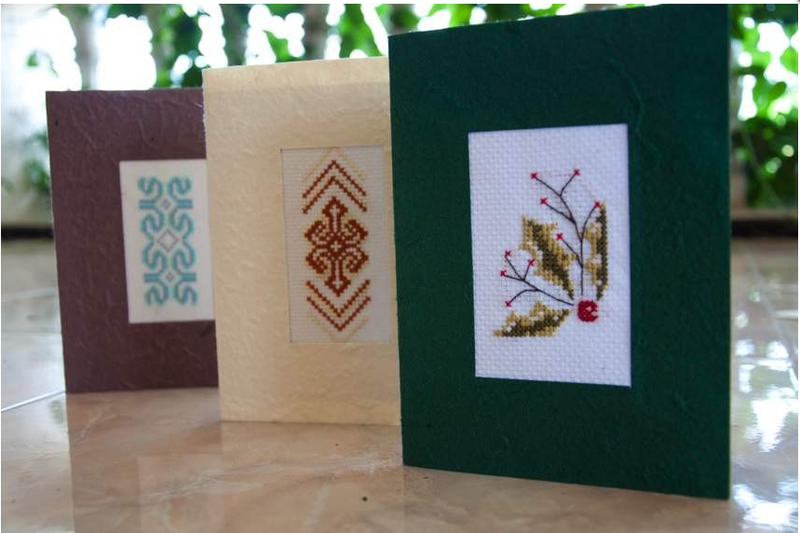 These cards were hand embroidered by women in the Mae-La refugee camp. Making these cards is one of their sole sources of income. I’m snagging some of these immediately! We have these adorable little handmade doll tree ornaments, dressed in traditional tribal clothing. Wow. Those cards are gorgeous! So much effort and thought …. This sounds like an incredible charity. There are so many worthy ones out there helping others. I love that!